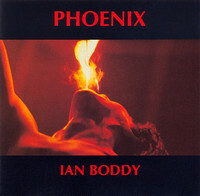 "Phoenix was Boddy's third vinyl album and the first to be released on his private label Something Else Records, prior to the creation of his DiN label. Guest musicians included a drummer, singer and saxophonist and it is probably Boddy's most rock orientated album. It was premiered at the 1985 UK Electronica festival in Sheffield and Boddy was joined on stage by David Berkeley who helped on concert keyboard duties for several years."